Alaska’s iconic Iditarod Trail Sled Dog Race began this weekend. Downtown Anchorage was a hive of activity, with the ceremonial start on Saturday, and then the town of Willow became the center of attention as the official restart took place on Sunday. The race is officially on, and will probably end in some 9 more days as mushers make their way about 1,000 miles to Nome. While the Iditarod is best-known as an annual dog sled race, it’s also a National Historic Trail, and parts of the trail itself are actually accessible all year. You don’t have to be a musher to find yourself on the Iditarod—on all of the following trails, you can drive your travel van right to the trailhead. The town of Seward is the beginning of the Iditarod Trail. Though the race now begins from the town of Willow, north of Anchorage in the Mat-Su Valley, the original trail began in Seward. In the days before telephones and airplanes, the Iditarod served as Interior Alaska’s transportation and communication line, with mushers bring mail and goods in, and taking gold out. Seward sits at the head of Resurrection Bay, a deepwater fjord that does not ice over in the winter, making winter shipping possible. Thanks to the Iditarod Trail, the goods that were dropped in Seward could then be transported to the gold fields at Iditarod and Nome, though the port of Nome is ice-locked for an entire season. To commemorate that position as the head of the trail, a tripod with a plaque, and a statue of a prospector have been erected at the downtown waterfront park in Seward. Starting next to the Sea Life Center, you can follow the trail along the bike path that also begins at Mile 0 and runs along the shoreline of Resurrection Bay, boasting spectacular mountain and ocean views. It’s common to spot sea lions and otters floating and playing in the waves just offshore, and at low tide, you’ll find plenty of opportunities for beach combing and rock hopping. Six and a half miles north of Seward sits Bear Lake, a popular recreation lake where you could see kayakers and canoeists, rowers and float planes. The trail begins past the houses and continues through the Chugach National Forest alongside the lake and into the forests above it. The original trail, of course, ran across the frozen lake, but in summer, the trail runs the length of the lake along the eastern shoreline. Though it follows the shore, it can be densely forested, and there are several stream crossings. The elevation gain isn’t great, but there can be a lot of steep ups and downs in quick succession. However, the points that the trail drops you onto a beach or rocky outcrop provide for those expansive views of lake and mountains that in Alaska are simply unparalleled, with a foreground of dense green spruce and hemlock and snow-covered Resurrection Peak towering behind. Here’s more info on the Bear Lake section of the trail. This 23-mile trail can be hiked from the southern or the northern end, and is generally considered to be a multi-day traverse. However, you don’t have to spend more time than you want to on the trail, and it’s equally as popular as an out-and-back from either side that covers just a few miles. The southern end, with a trailhead near Moose Pass, is heavily forested with spruce and hemlock, and gains elevation quickly, though the maximum elevation change is only 750 feet, so it’s not extreme. It follows along Trail Lake for the first couple of miles before climbing, and the views expand once you reach elevation. This is a popular mountain biking trail, especially on the weekends, so watch for bikes, or rent a couple of your own and join the crowds. Just across the Seward Highway from the northern trailhead is Granite Creek Campground—a great spot to basecamp in your travel van when you hike this trail. Here’s more info on the Johnson Pass trail. This is the most extreme of the hikes along the southern portion of the Iditarod, as well as another through-trail that, like Johnson Pass, is accessible at different points along the highway. The southern trailhead of Crow Pass is in Girdwood, and the northern end is in Eagle River. If you were to drive from one town to the other, you’d have to pass through Anchorage, but the trail runs through the heart of Chugach State Park, and stays completely within the mountains that tower behind the city. 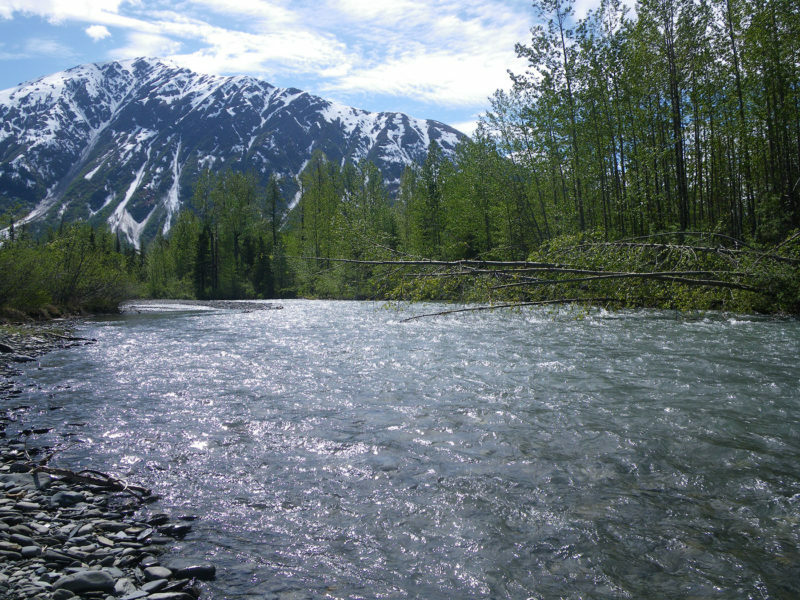 This trail is widely considered one of the best hikes in the Anchorage area. From the Girdwood side, virtually all of the nearly 2,000 feet of elevation gain happens in the first 4 miles. Halfway through that elevation, however, are the ruins of Monarch Mine, a gold mine that operated until the late 1930s, and a gorge with a cascading waterfall. Beyond that, gain a little more elevation and you’ll be able to see Raven Glacier, the first of the series of glaciers visible along the trail. For a day hike, however, the top of the pass is the most common spot to turn around. From the Eagle River side, start at the Eagle River Nature Center. The trail follows Eagle River for much of the early parts of the trail and offers beautiful views of the river valley. The trail is less technical from this side, and you’ll reach several river bend spots perfect for picnics and turn-arounds for day hikes. Check this site for current Crow Pass trail conditions. The town of Knik is now nearly a ghost town, but it was once a bustling transportation hub in the Mat-Su Valley. The town lost population to Wasilla with the completion of the Alaska Railroad, but mushing remained a big part of its appeal. Now, one of the few original remaining buildings in the town houses the Knik Museum and the Musher’s Hall of Fame. With nearly 50 names on the list, it’s a must-stop for any fan of dog-sledding or of the Iditarod. Nature trails from the museum run along parts of the historic trail, but the reason to stop here is the history. The Knik Historical Society runs the museum, and it’s a great place to learn about mushing lore and also about Alaska history. Check out this guide for more on Knik’s mushing history. While it’s definitely an extreme example of the lengths Alaskans will go for adventure, the Iditarod Trail is also a great way to experience a large piece of Alaska history—and you don’t have to spend weeks in the wilderness like the Iditarod mushers to do it! A drive to a trailhead and a hike to an amazing viewpoint will suffice. And, your travel van can get you there.